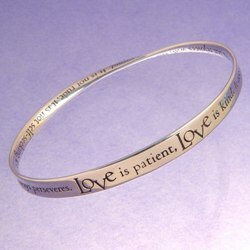 "Love is patient, love is kind. It does not envy, it does not boast, it is not proud. It always protects, always trusts, always hopes, always perseveres." 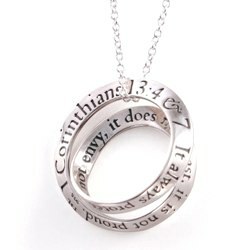 (1 Corinthians 13: 4 & 7) engraved in its entirety on a sterling silver Möbius strip. This circular "plane without end" has only one surface; accepted as a sign for infinity, it is also an ideal symbol for prayer. Oval in shape, bracelet is 2-3/4" by 2-1/2" in diameter; band is 1/4" wide and fits up to an 8" wrist. Sterling silver, ½ ounce, made in USA. 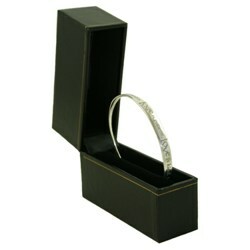 Includes gift box and info card.